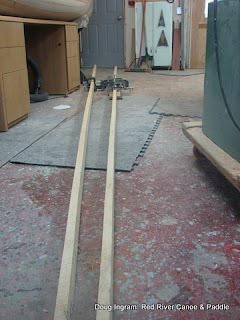 The seats on the new Boreal canoe will be hand caned. 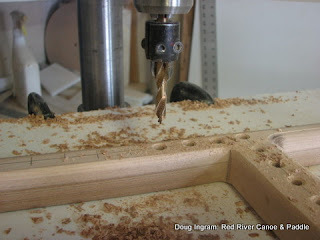 This requires that a series of holes be drilled around the seat frame. 1/4" holes on a 3/4" centers. Each hole, on each face, requires a small camfer to relieve the corner to not stress the cane strand. I've seen a lot of old seats with failed glue joints, so I always use epoxy along with the two dowels. You'll notice that one of the pieces is wider than the others. 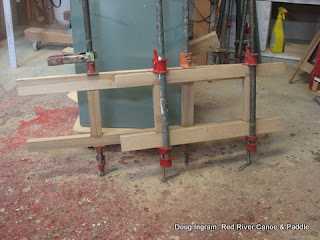 The front of each seat is 2" wide so that I can put a bevel on it, making it more comfortable to the paddler. And, of course, the gunnels. To the casual eye they are just a couple of long sticks, but there is a lot of work in them. Cutting the wood, milling it to dimension, rabbeting the back to sit over the planking, rounding over the corners, pre-varnishing the back sides, sanding the bottom. And that's all before they get put on the canoe! Posted by Doug Ingram at 8:12 p.m.